FRISCO – You might think running a natural foods store would be a healthy lifestyle choice, but Kathy Jones, owner of Alpine Natural Foods, was stressed to the maximum. She didn’t have a day off because when she tried to take one, employees called her at home, often complaining they weren’t getting along. She dreaded vacations because she ultimately came back to disaster. She knew she needed to do something to reach her goals of increasing profit, improving employee morale and creating a better shopping experience for customers. But rather than hire a traditional business consultant or spend more advertising dollars, she decided to hire intuitives Anne Salisbury and Greg Meyerhoff. Sure, she felt a little tentative hiring business consultants who also read energy. She knew them previously as clients who hired her to cater their wedding. But now she was the client. So in she went for her first meeting – arms crossed over body and mind fearing what Salisbury and Meyerhoff would see. But after sitting on their couch for three hours, which she says flew by, she felt like a weight had been lifted from her shoulders. 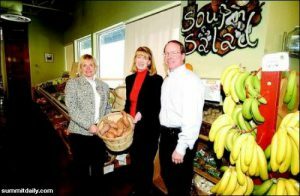 After the trio outlined goals, Salisbury and Meyerhoff showed up at Alpine Natural Foods wearing their grippable gloves, ready to not only psychically assess the energy flow of the store, but also to clear boxes and clutter. The first determent involved posters that prevented customers from looking in. Jones had been having problems with customers stealing items, which Meyerhoff attributed to the dark environment that made it easier to engage in shady behavior. They removed displays that blocked aisles and transplanted the salad bar to sit next to the soups. They suggested adorning tables with flowers and windows with fabric to create a more welcoming café area in order to increase deli sales. But they didn’t stop with simple feng shui principles. Once they moved items physically, they began to shift things energetically. Salisbury tuned in to her strong intuition, checking how energy flowed through the store once they made changes. While skeptics think energy work is flighty, Salisbury and Meyerhoff present it in a down-to-earth manner. Salisbury earned a master’s degree in transpersonal psychology and a doctorate in psychology; Meyerhoff worked in sales for 20 years, which helps him present information in a logical, easy-to-follow manner. Together, they blend decades of education and personal experience in meditation, intuition, psychology, hypnotherapy and a gamut of other therapeutic modalities into a healing approach for individuals, animals and businesses based in hypnotherapy, clairvoyance and life coaching. For Jones, the payoff came the following day, when beauty and health department sales doubled, which the trio had concentrated on the previous night to boost sales, Jones said. Salisbury and Meyerhoff also tuned into the employees to discover their strengths and their biggest complaints. Jones gave them a name only, and Salisbury did the rest. She saw, for example, that Courtney Carter, who had worked at Alpine for eight years, loved dealing with products more than she did people. Once they moved her into the position of product manager, she felt happier. Shortly after the changes at Alpine, a supplement broker who had traveled to health food stores nationwide told Jones her store had the best energy she had ever felt, Jones said. And Alpine isn’t the only place to say it has seen changes thanks to Salisbury and Meyerhoff. Tanya Benyo, owner of Mountain Sanctuary Spa, hired them to remove her blocks in relationships and financial matters. Since working with their techniques, she has more clarity in her relationships and business, which is growing, she said. Salisbury and Meyerhoff have primarily worked in Denver, and they intend to expand their business in Summit County. A 10 percent increase in sales and satisfied employees were enough proof for Jones that Salisbury and Meyerhoff’s changes actually worked. But perhaps the most compelling proof came just recently when Jones returned from a two-week vacation and returned to happy employees who didn’t bombard her with the usual litany of complaints that previously accompanied her return – even when the cooler broke down. Kimberly Nicoletti can be reached at (970) 668-3998, ext. 245, or at knicoletti@summitdaily.com.